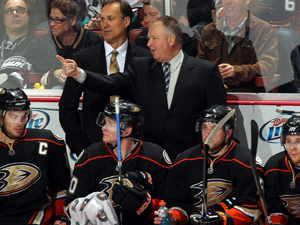 The Ducks have signed head coach Randy Carlyle to a new three-year contract through the 2013-14 NHL season. Carlyle was originally under contract through 2011-12. That contract year (2011-12) has been revised as part of the new three-year agreement. Per club policy, financial terms were not disclosed. “I’m very grateful to be able to continue coaching the Ducks into the future,” said Carlyle. "The Samuelis have laid a great foundation for success in Southern California both on and off the ice, and my family and I are happy to be a part of it." Carlyle most recently guided the Ducks to a 47-30-5 record for 99 points in 2010-11. The club clinched its fifth playoff berth in six years with Carlyle’s teams earning at least 98 points in four of his six head coaching seasons. Anaheim’s 47 wins were tied for second-most in franchise history, as the club finished fourth in the Western Conference in 2010-11. The club went 15-5-0 over the last 20 games of the regular season to qualify for the playoffs, despite losing goaltender Jonas Hiller midway through the season. Carlyle led the Ducks to a franchise-record fourth consecutive playoff appearance in 2008-09. With a 4-2 series win over San Jose in the Western Conference Quarterfinals, the Ducks became the fifth team to upset the NHL’s best regular season team (by standings points) in the first round since the Expansion Era began (1967-68). With the series victory, Anaheim advanced to the second round of the 2009 Stanley Cup Playoffs to face Detroit for the fifth time in franchise history. The Ducks stretched the Western Conference Semifinals to seven games before falling short in Game 7 at Detroit. In the most memorable season in team history, Carlyle guided the Ducks to their first ever Stanley Cup championship in 2007. Helping Anaheim become the first California team to win hockey’s ultimate prize, Carlyle also led Anaheim to its first Pacific Division championship in 2006-07, compiling a regular season record of 48-20-14 for 110 points. The club set franchise records in most major statistical categories, including wins, standings points and goals (254) – eclipsing marks the team set in 2005-06. In his first year as an NHL head coach in 2005-06, Carlyle took the Ducks to the 2006 Western Conference Finals following series wins over Calgary and Colorado. Anaheim’s playoff run followed the then best regular season performance in team history, establishing club records in wins (43), points (98) and goals scored (251). We started right after the year. We talked a little bit right after the season. I went to Europe for a bit and we were talking all along. Then, when we decided on the years and I brought Henry (Samueli) into the picture. It evolved over time. It has been an ongoing process. He’s a good coach. We are always competitive. No matter what kind of team we throw at him, he finds a way to make the team try to win. Sometimes it’s not as good a team as other teams. He takes what you give him and tries to win. He does very well at it, as his record indicates. He’s a good coach. His record speaks for itself. His best work came in the playoffs the year we beat San Jose and took Detroit to seven. I thought that was the best work I have seen him do. By the way, this is a coach who has won a Stanley Cup. He always digs down and competes. You have to love that. That is something that has evolved with not only our team, but over the league, the younger players coming in. He has his way with the young guys. He also took Getzlaf and Perry as kids too. The players are changing and he has to stay up with that. I think he’s done a good job with staying up with how they have changed. I talked to him three days ago. He had been struggling a bit. I think he was getting depressed about the whole thing. Finally last week, he had a few days where it wasn’t bugging him. He intends to go pretty hard this week with the bigger boys who are there in Helsinki. We are scheduled to speak after this week is over. I want him to be healthy. I have no timeframe on him whatsoever. You don’t replace him. There is a plan B. We’d have to do some things and look at building the team a different way without Teemu. You go about it a different way with your hockey team. That time is going to come, so of course we have thought about it. He feels great ever since that week. He feels real good about himself. I think Jonas is in a good place. We’ve been talking for probably a month and a half here on the direction we were both trying to get to. It’s been something that probably started right before the draft. Once the draft comes into play, usually everything else gets put aside. I would say that we were working at this thing piece by piece. There weren’t really a lot of contentious issues. It just took more time than normal I would say. There still always is a lot of turnover. If you look over the turnover from last year to this year, I’m sure that there were probably five or six head coaches who are coaching new teams. The turnover is always somewhat aggressive during the summer months, not only in hockey but in all of pro sports. Right now there seems to be a little bit more continuity with the coaches in the NHL. I’m fortunate enough that I have been involved with the same organization since ’05. I feel very comfortable with the Samueli family, Michael Schulman, Bob Murray and Tim Ryan. All of the management people in place, I have a good relationship with. No. `1 for us is our defensive hockey. We were able to defend only to a level that we just got by with. First and foremost, we want to become stronger defensively as a hockey club without giving up that offense. Special teams are always going to be a factor. An area that has been a concern for us the couple of years has been penalty killing. We have to tweak some things, make a few adjustments and become a little more aggressive. Ultimately, we have to start with the puck more in the faceoff circle. We have to devise some schemes to come up with that puck, not just relying on the center. That has been a focus of the coaching staff over the summer months here. We did an analysis of some of the top teams and what they did in the Stanley Cup Playoffs and the top-rated teams in the league. We looked back at some of things we did. Everything wasn’t doom and gloom with it. But we just didn’t seem to have enough consistency with that special team specifically. Probably as a player, I never really said I would end up being a coach. I thought a coach was a guy who stood on the side of the boards, drank coffee and blew the whistle. I used to kid with Terry Simpson that he had Velcro on his sweat suit because he never moved off the sideboards. After I got into the non-playing side of hockey, I did little bit of Director of Player Development and some radio work. I was afforded an opportunity by John Paddock to be an assistant. That is really when I found that I enjoyed the position. I enjoyed it because it was the closest thing to being a player. Even though you are on the management side, you are involved with the game at the ice level, which was very rewarding. In my mind, that is when I made the decision that I was going to put my best foot forward. I stayed in Winnipeg. The Jets went to Phoenix. I wasn’t afforded the opportunity to go there as a coach. So, I stayed in Manitoba. I was lucky enough to work for the people who actually own the Winnipeg Jets now. We worked with the Manitoba Moose. I was an assistant to Jean Perron. After Jean had left, there was a coaching and GM change after one year and I fell right into that position. I was a head coach for five straight years there and left for Washington as an assistant. I felt that if I was going to become an NHL head coach, I would have to spend some time getting acclimated again with the NHL. I had been away for a number of years. I thought that was a real important move. I went to Washington for two years and then I got an opportunity during the lockout to go back to Manitoba. I coached the Vancouver Canucks farm club. We had a great year and the following year I got an opportunity to go to Anaheim. The coaching has been a lot of fun. It’s been an exciting part of my life. I’ve enjoyed it extremely. I’ve been very fortunate at the NHL level to have the quality of players and management team behind me. That has probably the most rewarding thing, being able to work with people who view the game the same way that I do and feel there are certain things that have to be respected. We are the type of organization and hockey club that likes to represent our city. We implement a program. We never lose sight of the fact that we’re here to provide an environment for the players to have success. That has always been our No. 1 goal and to win some hockey games. You vary your approach on the individuals you have. You get to know the players. The newer players and younger players, I’m a believer that they have to earn their stripes. It’s not because you are drafted where you are that you’re given an opportunity. You have to come in and earn it. Usually there are not many problems with coaches and players, if there is a mutual respect. One thing the coach is always going to ask for is you just give us your best and the rest will take care of itself. The one area where I probably have mellowed is understanding the day-to-day rigors of the game, the travel schedule and the scheduling that these players are presented with. There are times when they just don’t have any gas. That is one thing we have noted more often than not. We’ve taken the players away from the rink, given them some time and space and done a few different things away from the game. We’ve let players recharge and done some team bonding. We’ve implemented more of that versus the practice, practice, practice, skate, skate, skate attitude. The one thing that you have to love with the players is their voice. They have to understand that you still make the call and the decision that is in the best interest of the hockey club. The players do have to be heard. There are times when you have to listen and listen attentively to what they have to say. There are messages that come back and you can send another message back to them in a subtle way. Players have to take responsibility for their actions. In our situation with this coaching staff, we love them to take ownership. One of our goals is to give them that ownership. Depending on the scheduling and where you are flying to, there are some situations where you’d always like to maybe re-do. Would it be better to stay overnight? Yeah, in some situation it would. In others, it makes a lot more sense to get out of the city that you have been in and get situated where you are going. The weather, airline, mechanical failures you encounter, the closure of airports, all those things run into it. Those are things you have no control over. You try to pick your travel schedule and meet your practice schedule. You try to mirror what your game schedule is going to be. You try to pick the days that you’re going to be able to get some work in. In the NHL, there is a lack of quality practice time because of the number of games. Geographically where we are, we do a lot more traveling and spend a lot more time in airports and airplanes than other teams do. That is just a fact. We pay a lot of attention to the details of our schedule and things we can provide to your players. Since the 2007-08 season, we have lived with the possibility of Teemu not playing for our hockey club. As a coaching staff and as management, we want him to play. But there is going to become a time where he is not going to play. Dealing with the situation we are in now, his body is going to tell him if he can play. The one thing Teemu has always expressed, he wants to be able to play tennis, play golf and be very active after his playing days. If he feels that his body is telling him that it’s time to stop playing, he’ll stop playing. The one thing that he has proven to us is that there is life after 40. He has been a dynamic player for us. He hasn’t changed his attitude. He has a lot of fun at the rink and provides a lot of energy for our group. He provides a lot of leadership for our group. He is a joy to be around. I don’t think he has a bad day at the office like you say. We think that is infectious with our younger players. I don’t know if it changes your thinking now. There are always these uncertainties that you go into the start of the season and training camp with. If Teemu Selanne is not going to play for our team, there is a plan in place that we have to implement. We welcome him back obviously. We’d be crazy not to. We just hope his body is telling him he can play for us. Our preparation is going to be to prepare our hockey club for the first game of the season. If Teemu Selanne is there, that is great. If he’s not there, then plan B has to go into place. That is a cruel way to look at it. But that is the reality of a coaching staff. You prepare your team to become a team and to play as a team. You can’t focus on one individual, be it a Teemu Selanne, a Scott Niedermayer and those level of players who have a huge impact on your lineup. You have to move forward. I look at it probably as something after you are done that you have been able to grind out a career and earn an opportunity to stay in one situation for an extended period of time. When you are involved in it on a day-to-day basis, it’s not like I’m sitting here after the season or during the season thinking what it’s going to be like coaching somewhere else. That is not what we’re about. My job is to prepare the Anaheim Ducks to win hockey games and to do the best job I possibly can to have these players represent not only this sweater, but this city and organization in all facets of the community. That is first and foremost. That is not going to change. As far as feeling good about it? Yeah, there is some satisfaction with it. But again, there is pressure that comes with it too. You have to deal with the pressures of coaching and preparing your group. When you don’t have success, it’s a lot more difficult than when you do. Sometimes even when you do have success, it’s not enough. I just try to remain in an even keel. The reality is when times get tough, we as a coaching staff and management have to show leadership. That is the No. 1 key for us. For any coach to stay, you have to be prepared to take responsibility and find a method to turn things around.